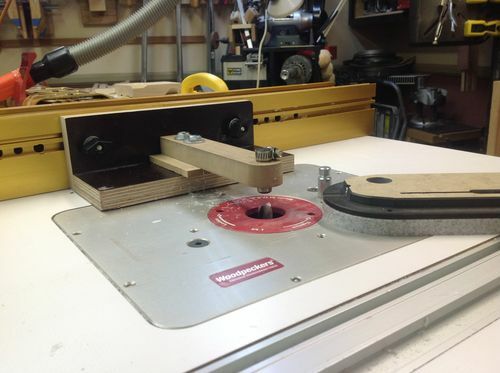 The Leecraft doesn’t use the front hold down screw that comes standard on this saw, rather, they use 2 horizontal screws (one in front and one on the right side). 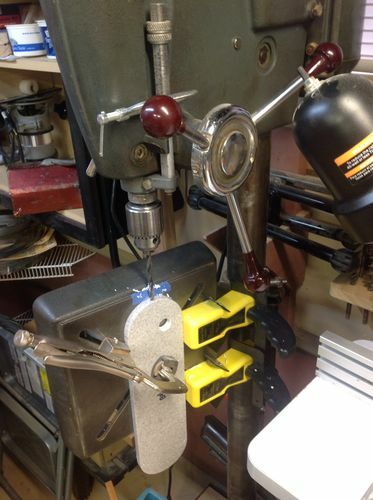 You tweak these screws to get just the right fit in the opening. They also use the 4 set screws to adjust the height. This is a REALLY messy process…..You must where a mask!! I did capture most of the dust even though the photos would suggest different…..
Also used a 1/2” spiral bit to carve a relief for the blade on the bottom of the insert. 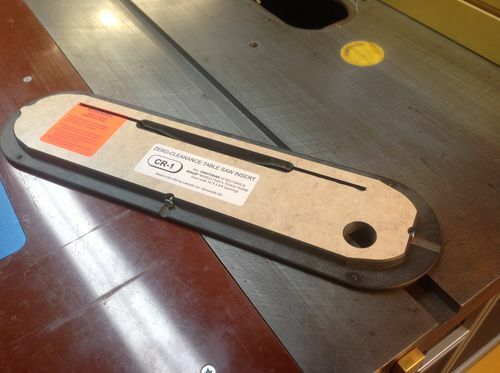 This also provides clearance if you run a stabilizer on your saw blade. 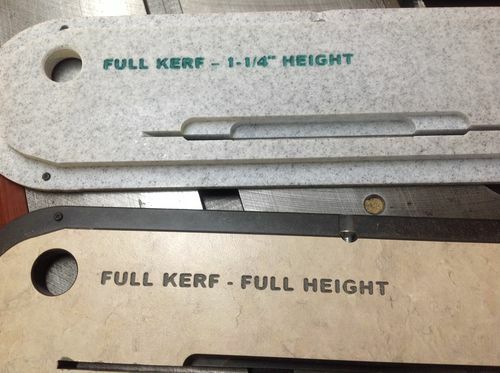 In hindsight, not sure I would carve this deep on future versions. 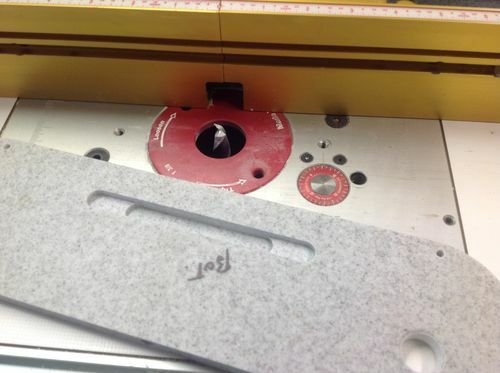 In order for the blade to clear the insert prior to cutting it through it, there is only about 0.060” left. That’s a little thin! 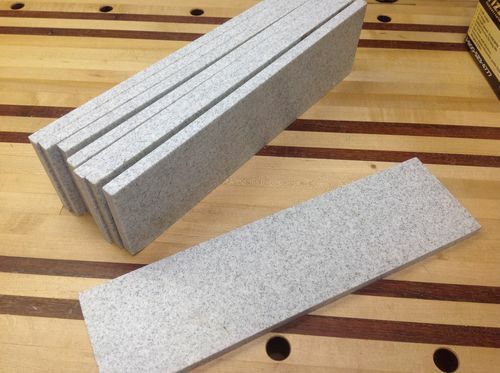 I would still cut the relief in the bottom, but not as deep, then use an 8” dado blade to start the cut, when cutting through…..Make sense? 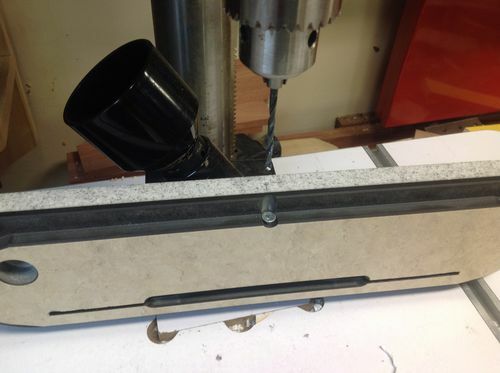 A couple of things to note here – the Corian is 1/16” thinner than the Leecraft so you can’t set the bit height from the Leecraft – you need to check it and make some test cuts. The dust collection works much better here from below the table. Just take it slow….takes 10-15 minutes to cut these shapes. The Corian is brittle, so I covered the entire insert with a tubafore before cutting through, and clamped it all down of course. 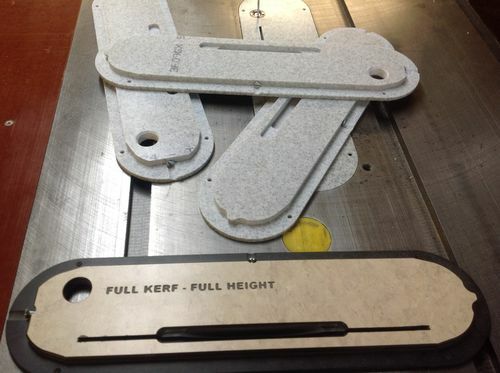 One of the problems with the 113 saws is the inserts are not really long enough to put a splitter in them safely, so I am going to have an insert (with a splitter) for cuts up to 1-1/4” and will have to switch out for an insert (without a splitter) for taller cuts. 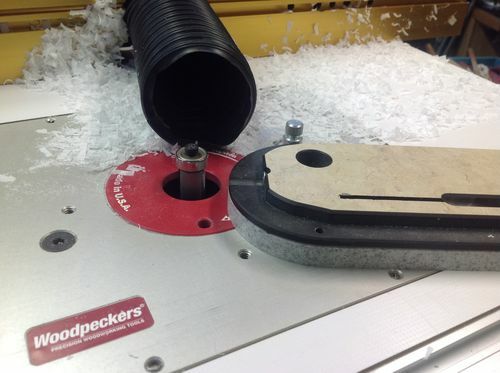 For cutting the 1-14” insert, you need to count the number of turns when raising the blade…. 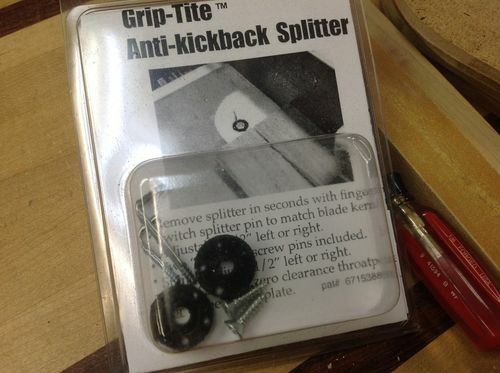 I built four of them, plus have the Leecraft, so hope they last awhile….I did read a tip online somewhere that said when the insert starts to open up from blade drift or deflection, you seal the top with tape and pour epoxy in the bottom and start over again…..I will be trying that some day. An interesting challenge…...thanks for looking. I have been looking for corian locally to make template out of it but not luck. Maybe I did not look hard enough. I love the blog. Very Detailed as you always do. 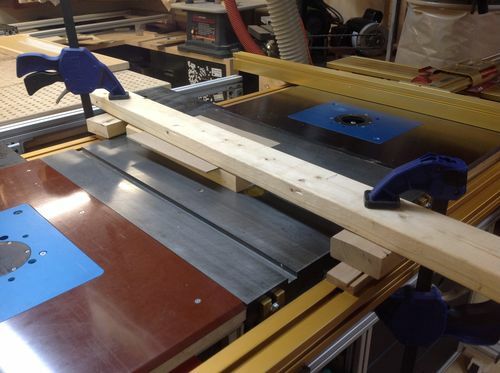 And that home made pin router, I am stealing the idea. 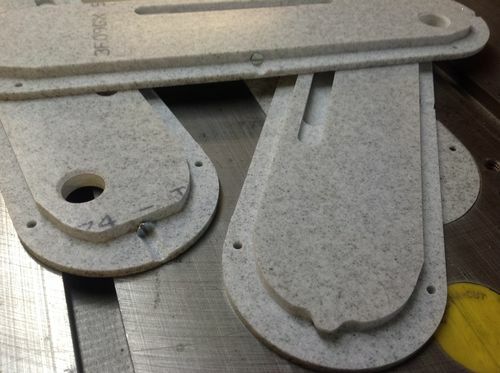 Looks like a nice adventure in Corian and pin routing too. Neat. Those look so professional! 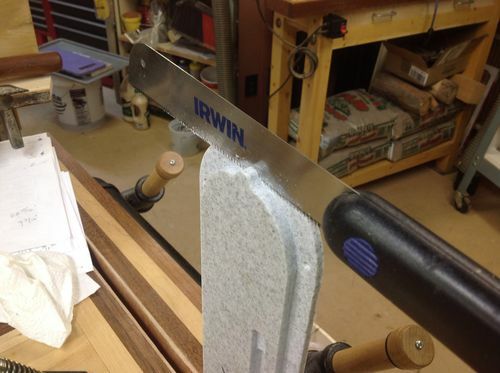 You better start marketing those as there are a lot of those old Craftsman saws out there. I was thinking “nicely done” and “those look so professional” but those are taken, so I’ll just say good job. Well done and excellent description. I’d like to know what you think of the splitter. I’m glad to see it worked for you jeff. I agree with Doe, we need a review of the splitter. I have some kind of doodad splitter thingys I used long ago. I can’t remember the name exactly since they were crap and got thrown into a drawer a long time ago. 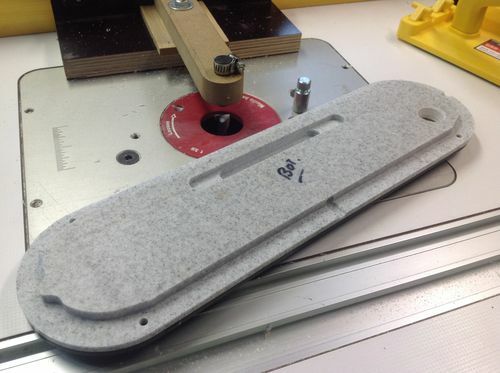 Hey Abbas….good luck on the Corian search…..it’s out there…...and steal away! 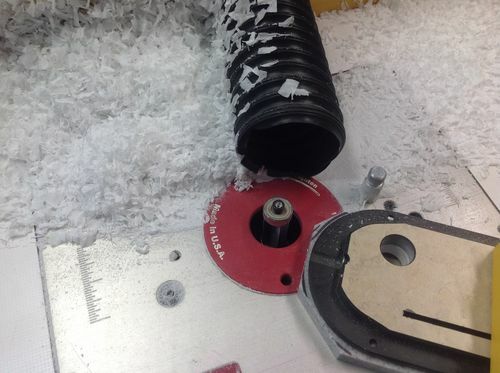 Andy – you’re right – lot’s of them saws but not my design…...it is a good design though for sure….once you get it dialed in, the insert just snaps in sweet…..
Doe and William – I will let you know how the splitter works…...I still have one of the MJ Splitters in the package, but seemed like a pain to install…..might try it later…..Thanks! Another great JL7 instructional blog!!! Great work and fantastic documentation. You always make it look so simple and easy to do…. Well, now that you did the hard part, all we have to do is copy your process!!! I too, am interested in the splitter review. Did I see hand saws and chisels. I love to see your precision and work. I suppose you can Randy…..but William might not appreciate it….....thanks! 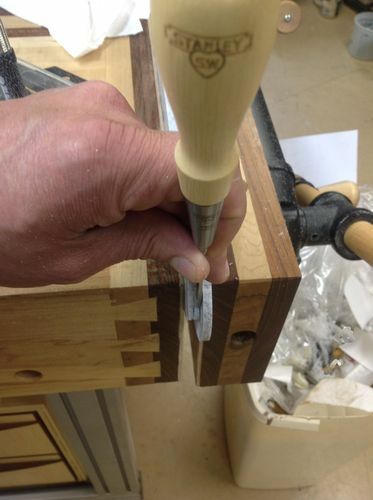 Hey Dave….I do break out the hand tools now and again…...this was a case where I couldn’t do it better without them for sure….....thanks man. These are thee fanciest zero clearence inserts I have ever seen. These should last you a lifetime. Wow! These ZCIs look great. You have great craftsmanship! I do have a question; how did you route that small tear drop shaped (for the lack of better description) locking feature using the pin routing technique. 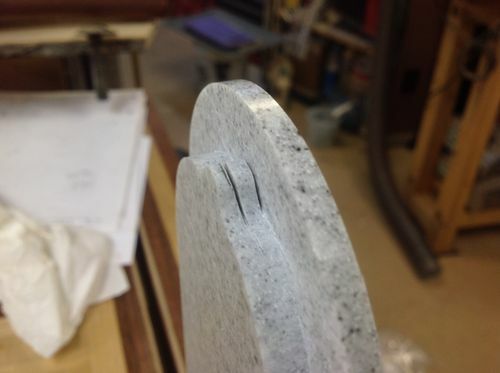 I am not very well versed in pin routing but if I understand correctly, it allows you to create that lip all around the blank by choosing an appropriate height of the router bit as well as an offset distance between the pin and the bit, correct? 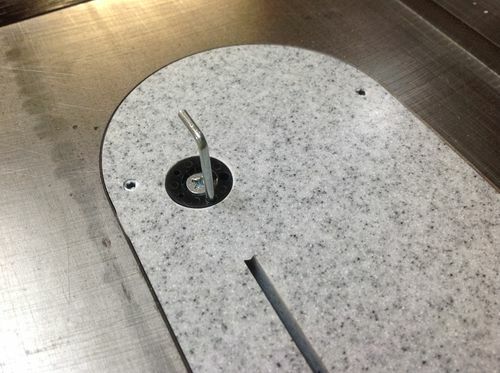 tool_junkie – the pin (for the pin router) is the same diameter as the bit and is centered above the bit. 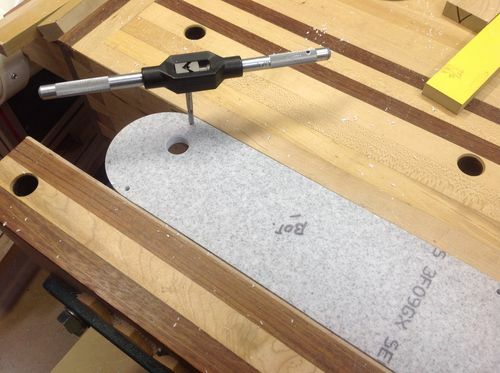 The pattern (which is the Leecraft insert) is attached using carpet tape to the top of the blank to be milled. 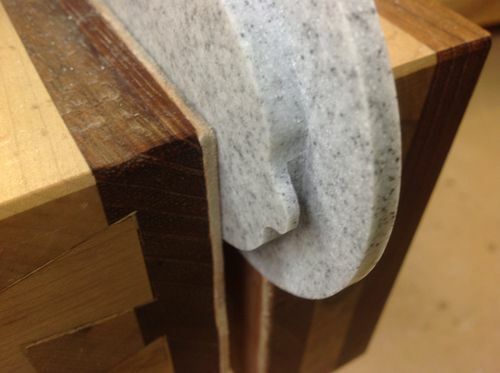 The pin router will follow the shape of the pattern exactly, so any shape (including the tear drop) will be reproduced. There is no offset involved. Let me know if this doesn’t make sense. Jeff thanks for the explanation. I think need to read up more on pin routing techniques.